Waves of Hope Michigan is a new non profit organization that is located in Muskegon. The purpose of Waves of Hope is to cover the cost of the Lake Express tickets for patients and their families traveling to distant medical facilities for treatment of diseases. Their goal is to take part of the financial stress off of the patient in hopes that they can instead focus their energy on improving their health and quality of life. I recently got to do a ground up build for this great organization. The logo was done by a great local artist. I was given that and a collection of documents and told to do my thing so off I went. For the Waves of Hope MI site I went after a pretty minimal design trying to keep it professional looking. At it’s current stage there are only a couple of pages showing the information that the patients would need and some forms to download. I am sure in the future we will be adding much more information, as well as some stories on some of the patients that we are able to help with our program. 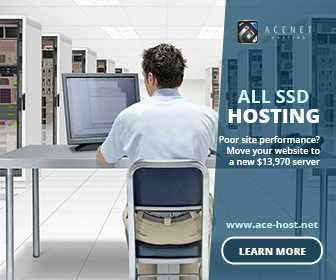 They are up and running currently and could use all of the support possible to keep things rolling. 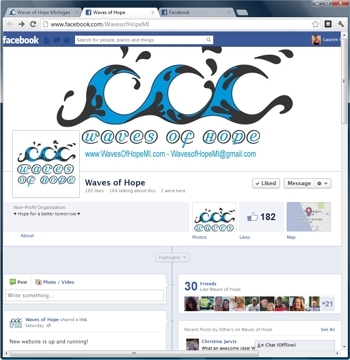 We of course right away started a Facebook Fanpage for Waves of Hope that can be found at http://www.facebook.com/WavesofHopeMI. 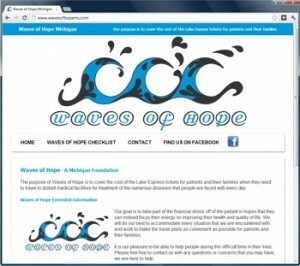 Visit the Waves of Hope Michigan website or the Waves of Hope Facebook Page today!